If you were going to throw a birthday party for the Milky Way, how many candles would you put on the cake? What is the age of the Milky Way? Well, even though this is a difficult question to answer, either way you slice the cake you need a lot of candles. 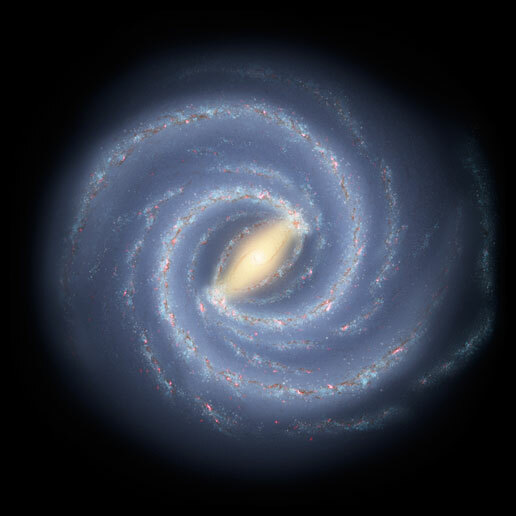 If you were to put a candle for each year the Milky way has aged, then you’d need between 10 and 13.6 billion candles. That would be mighty difficult to blow out all in one go. The oldest stars in the Milky Way are 13.4 billion years, give or take 800 million years. This is somewhat close to what the age of the Universe is (which hovers around 13.7 billion years). By measuring the age of these stars, and then calculating the interval between their formation and the death of the previous generation of stars, we can come to an approximate age of the Milky Way as 13.6 billion years. Here’s a good article on how this process works. The age of the Milky Way is determined by measuring the amount of beryllium present in some of the oldest known stars in the Milky Way. Hydrogen, helium and lithium were all present right after the Big Bang, while heavier elements are produced in the interiors of stars and dispersed via supernovae. Beryllium-9, however, is produced by collisions of cosmic rays with heavier elements. Since beryllium is formed in this way, and not in supernovae, it can act as a “cosmic clock” of sorts. The longer the duration between the first stars that created heavier elements and the stars that make up globular clusters in the early Milky Way, the more beryllium there should be from the exposure to galactic cosmic rays. By measuring the beryllium content of the oldest stars in the Milky Way, the age of the Milky Way can be approximated. This method is kind of like using radioactive decay of carbon-14 on Earth to determine the age of fossils. Radioactive decay of uranium-238 and thorium-232 gives an age of the Milky Way as similar to that of measuring the abundance of beryllium. The age of the Milky Way is a tricky question to answer, though, because we can say that the oldest stars are 13.4 billion years old but the galaxy as we know it today still had to form out of globular clusters and dwarf elliptical galaxies in an elegant gravitational dance. If you want to define the age of the Milky Way as the formation of the galactic disk, our galaxy would be much younger. The galactic disk is not thought to have formed until about 10 – 12 billion years ago. Here’s an article on how the bulge in the Milky Way may have formed earlier than the rest. Also, we’ve recorded a show all about the Milky Way on Astronomy Cast.